The research conducted by the Estudios Técnicos firm presents the behavior of users in digital media, Internet and mobile phones in Puerto Rico. Currently, some 807,000 people in Puerto Rico shop online and spend an average of $158 a year. Based on the median of purchases per year, in Puerto Rico online shopping spending equals about $127 million, which represents a 13 percent increase compared to $112 million in 2016. This is one of many findings included in this year’s Sales and Marketing Executives Association’s “2017 Digital & Mobile Behavioral Study” released Thursday. 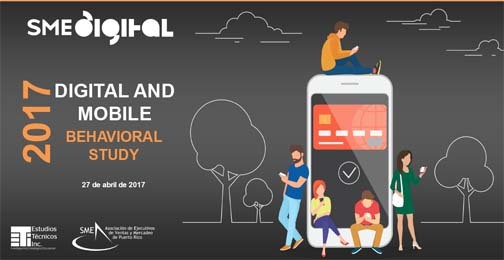 The research conducted by the Estudios Técnicos firm presents the behavior of users in digital media, Internet and mobile phones in Puerto Rico. “Although a slight increase has been observed in the past few years, purchases at local sites are still low when compared with purchases outside of Puerto Rico. About two out of 10 of the people who shop online do so on local sites, versus nine out of 10 on sites outside of Puerto Rico,” said Anitza Cox, director of analysis and social policy for Estudios Técnicos, during a presentation at the Puerto Rico Convention Center. When inquiring into the reasons why they do not buy from local businesses via the Internet, 55 percent said the costs of buying locally are higher, 45 percent indicated it was not necessary, 34 percent said local businesses where they shop are not online, and 31 percent noted they do not have the products or services they are looking for. “Local retailers have an area of opportunity with online purchases if they invest in eCommerce platforms, or participate in common-use platforms such as those that have been developed in the past years,” said Cox. The study also showed that the incidence of internet use remained practically the same with respect to 2016 — a slight increase was observed from 70 percent to 71 percent, which represents an estimated 2,184,889 Internet users ages 12 and older. The favorite content of internet users, in order of priority, is still video, music, photos, news and memes. In terms of the incidence by age, a significant increase was observed in the group of 65 years or older. In 2016, the incidence of this group was at 15.7 percent, while in 2017 it increased to 29 percent, the study showed. The mobile phone is the preferred medium for connecting to the internet at 93.2 percent, followed by the computer, at 29.5 percent, and tablets, with 19.3 percent. On the other hand, increases are already evident — although still within the margin of error — in the use of game consoles, Smart TVs, and electronic games to connect to the internet. In their social interaction, 61.2 percent use emoticons in their conversations. Nearly six out of 10 mobile phone users downloaded apps in the 30 days prior to the study. Of those, 19 percent paid for one or more of those downloaded apps. Social networks (90.2 percent), messaging (87.5 percent) and video applications (83.6 percent) are the top apps users have on their mobile phones. The five most used local apps are El Nuevo Día, Primera Hora, Banco Popular, ATH Mobile and Wapa. 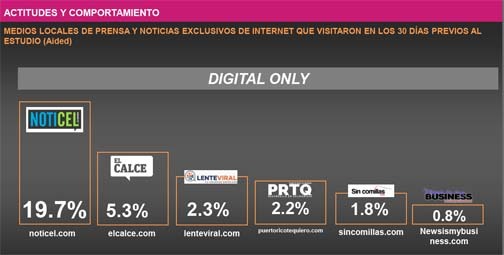 Of the island’s main media, El Nuevo Día (51.5 percent) is the most visited local press and news media site, followed by Primera Hora (45.8 percent), El Vocero (35.3 percent), Metro (25 percent), and Indice (17.2 percent). News is my Business is among the most-visited digital news websites in Puerto Rico. In television, the online site for Wapa TV (31.3 percent), is followed closely by Telemundo (29.3 percent) and Univisión (20.5 percent). Of the websites that exist exclusively on the Internet, Noticel (19.7 percent) was the most visited local press and news media in the last 30 days in Puerto Rico, followed by El Calce, Lente Viral, Puerto Rico Te Quiero, Sin Comillas and News is my Business. According to the study, 2 million users have a presence on a social network and use them mainly to view photos, read news and watch videos. Although it fluctuates according to the age, the main networks are Facebook, YouTube and Instagram. In fact, 72.8 percent of respondents use Facebook more. Some 23.5 percent of internet users said they often join online communities, with the main ones being music, games and social causes. The study was conducted during the months of March and April, comprising an islandwide, probabilistic and stratified sample, with random sample selection units. It was based on two phases of 750 interviews of people aged 12 years and older, representing the population of Puerto Rico by age, gender, income level and region. The maximum sampling error is +/- 4.3 percent, Estudios Técnicos confirmed. Hey Buddy!, I found this information for you: "SME study: Online purchasing up 13% in Puerto Rico". Here is the website link: https://newsismybusiness.com/online-purchasing-puerto/. Thank you.